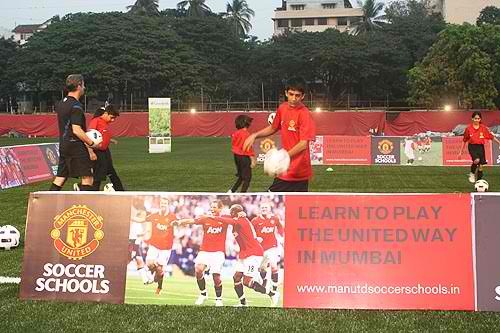 Yes, the Manchester United Soccer Schools (MUSS) have finally started in Mumbai from Jan 2012. They have had kids enroll all over India and some even from abroad! The classes are held at the Cooperage and are aimed at kids between 8-17 years of age. They also have classes for 6-7 year olds and 18+ year olds. The age-appropriate programs will take place over five weeks at a time, with players attending two sessions each week. One session will focus on practicing the technical skills needed to play the United way, with the second session of the week providing players the chance to test their skills in a series of games. All players attending the programs, regardless of ability, will be able to take part in a series of fun and challenging coaching sessions following the latest MUSS curriculum. These activities, based on principles and methods employed by the famous Manchester United Academy, will focus on a variety of different technical areas, such as dribbling, short passing, turning and finishing, and will provide players with the tools and confidence to improve their own game. Each series of five week programs will be themed so that different areas of the game are analysed each time.